1. It's my Mom's 70th birthday today! Happy birthday, Mom! 2. My Grandma's Memorial Service is a week from tomorrow. 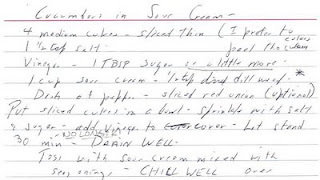 I was searching through my recipe box for a recipe of hers that I could make for the gathering afterward, and came across her hand-written recipe for Cucumbers in Sour Cream. 3. Some of my friends have reported having a bumper crop of cucumbers this year. 4. My blogging buddy, Shelby, is hosting a blogging event I like called Family Recipes: Memories of Family, Food and Fun. I was so happy to find the recipe written in her own handwriting. What a treasure it is. I almost never write recipes on recipe cards any more. The recipe calls for salting cucumbers and draining them, which makes them denser and more crunchy. The creamy dressing gets its tang from sour cream and vinegar, sweetness from a little sugar, and is accented with some dill. It's old-fashioned but I love it. Although the recipe is a treasure to me, her "chicken scratch," as she called it, would be illegible to anyone outside the family. She wrote recipes in kind of a shorthand and didn't use a lot of measurements. Here's my translated recipe. Put sliced cucumbers in a bowl. Sprinkle with salt and sugar and toss. Add vinegar to cover. Let stand 30 minutes -- no longer. Drain well. Mix the sour cream and seasonings. 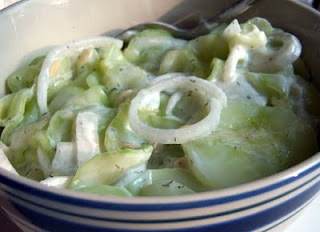 Toss the cucumbers and onions, if using, with the sour cream mixture. Chill well. First of all, Happy Birthday to your mom! Secondly, thank you for posting this! Grumpy has been after me to make something similar but I had never had anything like it before. Now I can try your recipe on him! I'm sure your family will enjoy your grandmother's cucumbers after her memorial. This is bound to make her memorial more special. I'm sorry about Grandma. How lucky you are to have had a grandmother that your own kids could know. That recipe is awesome. I'm saving it for next July 4th and for a few dozen times before that as well. PS I'm assuming Grandma used white vinegar. Shelby, I actually won't be making it for the party because I have to drive 600 miles to get there! I'm trying to think of something that will travel without refrigeration. Sue, Yes it's white vinegar. Good catch -- I corrected the recipe. And indeed I'm glad my kids knew her. LOVE the recipe=--I love cucumber salad. LOVE the story/finding the recipe even more! A year or 2 before my grandma died I asked her to write some recipes down for me. her hand shook, I can barely read them, but I treasure them nonetheless. You must have been very excited. Thanks so much for submitting--it's perfect. What a nice way to enjoy cucumbers! My mom use to make a recipe very similar to this one and it is a realy memory for me each time I eat it. Thanks for sharing your grandma's version. Oh my goodness, I was googling for apple cake, found your photo of apples on Tastespotting, looked at your other photos and clicked on a picture of your Banana Nut Coffee Cake with Caramel Frosting (another "oh my! "), then clicked on your current post and found my all-time favorite sour cream cucumber dish--your Grandma's recipe is exactly how I like mine! So glad to find your blog! Found this recipe via a google search and made it last night. It was so wonderful. We've been looking for the perfect way to make sour cream cucumbers and I believe we found it. How lucky for you to have your grandma's original card. Thanks for sharing! Glad you enjoyed them, Donna Jo! Grandma recipes are always the best.